Zapier Platform includes two ways to build new integrations: our UI with an online visual builder, and our CLI. Both let you connect your app's API to Zapier to authenticate with user accounts, build triggers and actions, and promote your app on Zapier's app directory. Zapier Platform UI is the easiest way to build new integrations in a web app. Add your app details, authentication settings, triggers, and actions in an online form, with help text and documentation links to help anytime you get stuck. You can test each part of your integration inside the visual builder, switch to code mode for advanced calls and response parsing, check logs and API response details, and rapidly iterate to build a complete new Zapier integration. It's an easy way for anyone with API experience to build Zapier integrations. Zapier CLI is the most advanced way to build integrations in your local development environment. Based on Node.js, Zapier CLI is a terminal-based app that helps you scaffold new integrations. Once you've coded your app details, authentication, triggers, and actions into the Zapier app package, you can push your Zapier integration to Zapier's server, manage new versions, and invite collaborators all from the command line. It's a powerful way for engineers to build Zapier integrations in their standard development workflow. Zapier Platform UI and CLI both include the same core authentication, trigger, action and most testing features. 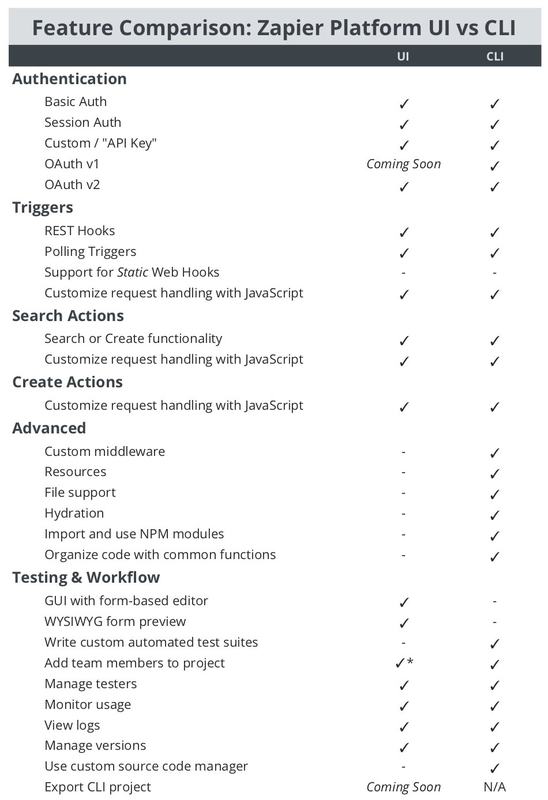 The CLI additionally lets you add advanced features including resources, middleware, files, hydration, and NPM modules, along with options to write custom test suites. The UI gives you an easier way to build integrations with a form-based editor and WYSIWYG preview of your integration in Zapier, with the option to export projects coming soon. You can accomplish the same goals and build equally powerful Zapier integrations with both Zapier Platform UI and CLI. The best one for your integration depends on your work style and integration needs. Zapier Platform UI is the easiest way to build new integrations. With a general understanding of API authentication and calls, you can build a full Zapier integration without any coding. Its visual builder sets many of the defaults for you automatically. All you need to do is add details about your trigger and action steps, build input forms for users to enter data, and set the API call details to send that data to your app. 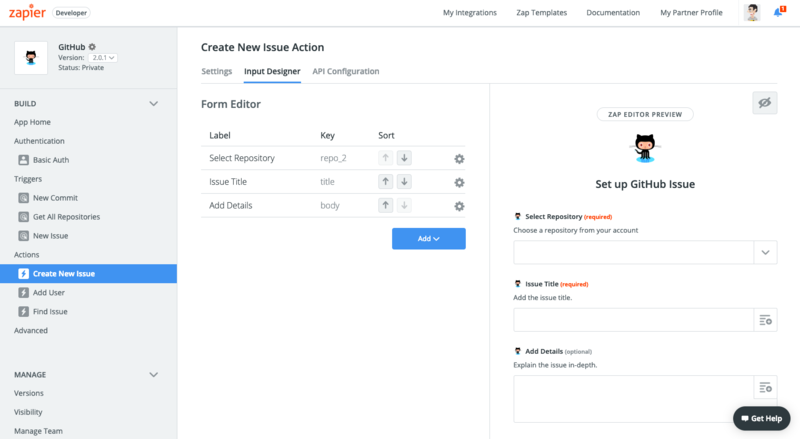 Choose Zapier Platform UI for your integration if you're new to Zapier integration development, want an easy way to build a new integration, or have a team with non-engineers working together on the integration who would find the CLI more difficult to use. → Build a new Zapier Platform UI integration, check our Quick Start Guide to build a sample integration, then get more info in Zapier's Platform UI documentation. Zapier CLI lets you build advanced integrations faster than visual builder since every part of your integration is custom built by default. You can use npm modules as you would in any other Node.JS app, test your integration locally, view detailed HTTP logs, and get started quickly with scaffold and demo apps. Choose CLI if your API needs custom coding for most API calls or you find writing integrations in code easier than using a web app, and if your integration will maintained by an engineering team. Zapier CLI is more difficult to use for non-engineers, but will likely be more efficient for an engineering team to use than visual builder. And soon, you won't have to choose: You can start with visual builder, then switch to CLI later if you want. 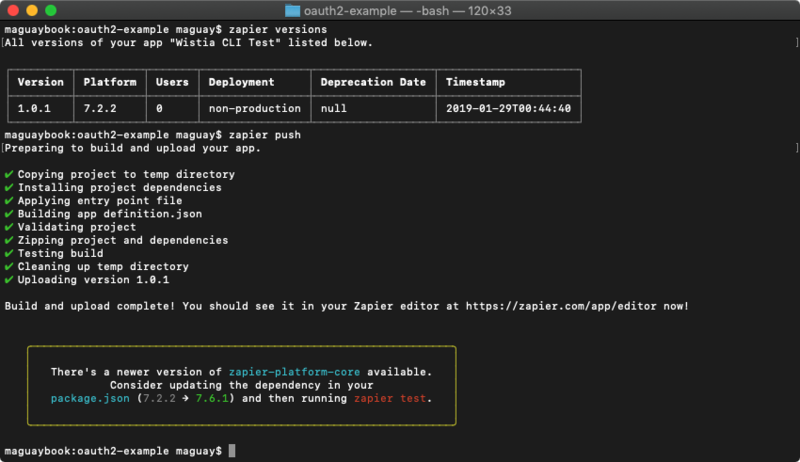 ‌→ Install Zapier Platform CLI with npm install -g zapier-platform-cli, check our CLI Quick Start Guide to build a demo integration, then learn more in Zapier's CLI documentation. Zapier Platform UI is a new way to build Zapier integrations—and we have a lot planned for it. Today, you can build full integrations and ship them from the visual builder. Coming soon, it will also let you monitor feature requests for your integration. You will also soon be able to scaffold new integrations in the UI, then convert the integration to Zapier CLI and continue your integration development there. If you've built a Zapier in the past with our legacy web builder, we'll let you know when you're able to convert your existing integration to the visual builder, so it's easier to maintain your integration and add new features. Look out for more announcements from us!